¡Hola! ¡Feliz sábado a todos! Creo que hace tres años que hice mi última tarjeta para bebés, así que he pensado que ya era hora de tener un par de ellas listas para la ocasión :). These cards were actually pretty easy to put together. I used the adorable stamp set "Oh, baby" from the newest Simon's release and a cloud stencil (that you can make yourself if needed) to create the backgrounds. All the details are in the video below (you can also watch at my Youtube channel). Estas tarjetas han sido muy fáciles de hacer, la verdad. He usado el set de sellos "Oh, baby" de la nueva colección de Simon y un esténcil de nubes (que podéis hacer vosotros mismos si no tenéis uno) para crear los fondos. Todos los detalles están en el vídeo de aquí abajo (también podéis verlo en mi canal de Youtube). a comment, so make sure you visit every stop for more chances to win! The winners will be announced on the Simon's Blog on Wednesday, March 14, 2018. You can also check yesterday's hop here. 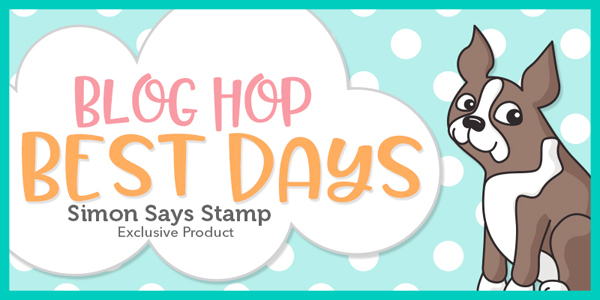 Esta entrad es parte de un blog hop para celebrar el último lanzamiento de Simon Says Stamp ¡y también hay un sorteo! Simon regala un certificado de 25$ para su tienda a un afortunado o afortunada en cada uno de los blogs que participan. Solo tienes que dejar un comentario, así que asegúrate de pasar por todos los blogs para tener más oportunidades. Los ganadores se anunciarán en el Blog de Simon el miércoles 14 de marzo de 2018. También podéis ver el blog hop de ayer aquí. Your next stop on the hop is the super talented AMY RYSAVY ! The Stork cards are gorgeous. The colors are spot on and I must admit I'm a sucker for shaker cards. such precious cards and adore your color combos! What a beautiful thing!!! I love the cards, they are so adorable !!! Thank you for showing them and for giving us so much inspiration! These are very cute and so sweet. Precioso trabajo,senzillo pero adorable como todos los que haces, felicidades! Your shaker cards are so cute! My all time fave style of card is the shaker. These are simply over the top cute! The new products are just awesome! Your stork baby cards are so cute. Love the shakers. These are so cute. I love shaker cards! Gorgeous cards - love the backgrounds! Love love love your shaker cards! Anyone would love to receive them!! I love these adorable shaker baby cards! Cute shaker cards for baby! Wonderful cards today! Thanks for sharing. Such pretty cards! I love the colors! Love your clouds! So much talent on this hop! Loving it! These turned out wonderful in both colors. Who doesn't love a good shaker card? Love your color selections. TFS! Your baby card shakers are so precious! What new Momma wouldn't be thrilled to have one of these??? Simply adorable! Precious cards! I love the stork and your beautiful backgrounds! Godh, these cards are wonderful. If i were the recipient, i would frame them. Beautiful color blending. Gorgeous baby cards. I love the soft cloudy skies and I adore that it is a shaker card - the background is perfect for it! Beautiful baby cards! I love that you turned them into shaker cards, they are so pretty with that cloud background! Thank you for sharing with us! So lovely cute and what a keepsake and heartfelt card to give!! Thanks for ur amazing talent!! Oh I love that you turned these into shakers, so cute! These are some of my favourite images from this release. Love your shakers. Beautiful cards, love both of them. Cute baby shakers--I like that you made a boy and girl version. Sweet baby cards. Making them shakersreally adds interest to the cards. Sweet baby shaker cards! Love the baby stamp set and sequins used are nice too! Awwwww!! Too much cuteness!! I love shaker cards and you make some perfect cloudy backgrounds!! I love the shaker cards and the little stork is too cute. wonderful cloud background for your cute stork - love the shaker card too! The stork shaker cards are simply wonderful! I love the cloud backgrounds! Beautiful baby cards! I love the clouds and how you turned them into shaker cards!! Love these baby cards! Will definitely need to get that stamp set! Hi Amanda, Your 2 cards are so adorable and very cute. I love the colors and I love the shaker part, I am addicted to shaker cards, awesome post today, thanks. So sweet! Love your pink and blue clouds with the storks and shakers! so cute and fun baby cards, love the shaker and colors used. Thanks for sharing. Your two cards are really sweet and beautiful ! I love your soft coloring, it's absolutely perfect. Thank you for sharing your creativity with us. Beautiful shaker cards! The colours are lovely. wonderful skies and adorable cards! Love those sweet shaker cards! A friend of mine is waiting for a boy... I think I will take inspiration from your cards for her! Love the sparkle with the shaker cards. Thanks for sharing your creativity!! Love the color combination of your cards !! They are so cute !! These are lovely. The peach one in particular is ethereal — the clouds look touched by a sunset. Love these adorable shaker baby cards. This stamp set is filled with great designs for creating cute baby cards! Your shaker cards are adorable! Love this new release. Love the cloud backgrounds and stitched frames - adorable shaker baby cards! TFS! Fabulous cards Amanda. Thank you. Que precioso! Gracias por compartir! Very cute baby cards! Those images from the stamp set are adorable. Great idea to have the storks flying across the clouds on shaker cards! Thanks for sharing your creativity! Your cards are always made with such care and always so pretty! These are super cute too! beautiful cards, as usual! Thanks for sharing your creativity!! Beautiful shaker cards. I love the style and awesome images. What great shaker cards! I am loving the stork stamp! Your stork cards are the cutest! Those cards are absolutely adorable. These are the sweetest softest looking shaker cards! Great release. Sweetest shaker cards ever! Love the colors. Super Sweet and ADORABLE shaker card!!!! Both cards are so pretty, love shaker cards!! Thank you for sharing!! Super cute baby shaker cards. All of your cards are outstanding. So cute! I love your cards! So cute! Lovely backgrounds and expertly colored images. Pretty!! Love how you did the background - so simple!! Love these cute shaker cards!! The cards are adorable! I love the cloud stencil. It was perfect. Cute and very eye catching. Love shaker cards!! Love the cloudy skies behind the storks in your sweet shaker cards! Adorable! So darling! Love shaker cards but I never make them. Thanks! Such cute cards! Love the soft ink blending for the background. love those shaker cards, and the font/handwriting in this new set. I love these cards (baby cards are so much fun). I especially love the girl card, with the background extending past the frame, I am going to have to give that a try on one of my upcoming cards. Beautiful. So Pretty. I'd like to try that cloud stencil. I love your cloud backgrounds - gorgeous! These are adorable shaker cards! I love the new baby sentiments; they are so sweet! These are great shaker cards! Love your color choices and overall design. The cutest shaker cards! Fabulous release! Beautiful cards! Love the soft colored cloud backgrounds. Adorable shaker cards! What fun! Love both your shaker cards! Wow just love your Baby Shaker Cards Amanda, fabulous design and I need those stamps lol!! Your baby shaker card are super adorable!! Such wonderful cards. Thanks for sharing. Love your videos, Simon Says Stamps always have cute stamps. Thank you . Love your shaker cards!! Your cloud backgrounds are fantastic! Your baby cards are so adorable and sweet! Super sweet and fun cards! What a fabulous way to welcome a new little one. I love your shaker cards! These cards are just adorable. I love shaker cards! Adorable baby cards!! I gotta have that stamp!! Beautiful shakers. The coloring is gorgeous. Such cute cards!! I love the shaker card. Beautiful colors on both. Love your cloud backgrounds on these cutie shakers! What a adorable shaker cards, love the way you made the background by both of them, lovely colours! Thank you for showing us these great cards and how to make them. Such sweet cards! So precious! Beautiful baby cards!!! Love that you did the shaker! You make the cutest cards, and I always look forward to new videos!!! I love this shaker card. The colors you picked are incredible! Thanks you so much for your wonderful videos! The shaker card was adorable! You are so inspiring!!!!! Such lovely shaker cards. And baby cards ideas just when I need them. So soft and sweet! Love the shaker element!!! Very sweet shaker cards for babies. You’ve made such a sweet duo of cards !! Love these cards! The backgrounds are so cool with the pink and blue clods! Adorable cards -- so cute! Love the backgrounds. Very very sweet. Loved learning how to use the cloud stensil! Lovely baby shaker cards! ...one of my favorite stamps from this release. Thank you. Great cards, your background colors are beautiful! Wonderful baby cards and love that you made them into shakers! Thanks for the video too. Love the cloud effect on these cards! I really need to make some baby cards. I have several friends who are becoming grandparents soon. These are lovely. Loved your adorable shaker cards. Thanks for sharing! The shaker cards are so adorable....love the soft cloud background! !